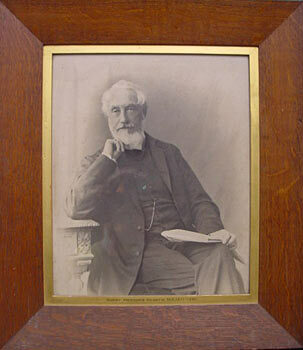 Rev Prebendary Henry (Harry) Mengden Scarth was rector of Wrington from 1871 for 19 years. In common with many country parsons of the time, he was a scholar. At least one of his interests was clearly archaeology, and, in particular, that of the Roman period. This article was published in the Proceedings of the Somersetshire Archaeological and Natural History Society, 1877, Part II, pp 8 - 11. The summit of Cadbury Hill is encircled by a slight fortification, and the area has the traces of ancient dwellings. Rutter (Hist. of Som. p. 73) says, "The fortification is very rude and irregular, consisting in many places of little more than the steepness of the hill, assisted by a slight ditch, wrought out of the rocky soil. Toward the eastern side is an oblique entrance, and further on toward the south is another straight. The south side is precipitous and rocky, and near this side, toward the west, is a circular depression in the earth, having the appearance of a well, filled up." This is a very fair description of the camp. In the month of June or July 1877, an interment was found on the north side of the summit of the hill, which is the property of the Rev J. W. Hardman, L.L.D., of Cadbury House. Some labourers having been sent up to procure earth, came upon a skeleton, enclosed in a grave, or rudely-constructed cist, composed of rough stones of white lias. The skeleton was perfect; and the teeth in the jaw were those of a person of mature age, all in excellent preservation. With the body were found many fragments of broken pottery, some coarse black, two or three pieces of red Samian with patterns on them, and one piece of Caistor, or Durobrivian ware, also fragments of Roman roofing tiles, one nearly perfect with the nail remaining in the hole for fixing, and a whorle of Kimmerage coal, partly broken, but containing the circular hole for the thread or flax to pass through. A similar whorle of the same material has been found at Charterhouse-on-Mendip, among the Roman relics. On visiting the spot next day, there was found in the loose soil a coin of Constantine the Great (bronze), but much corroded. The head of the emperor is, however, plain, and the legend, CONSTANTINVS IVN (?) NOB. CAES .(?) On the reverse are two Roman soldiers completely armed, and between them two military standards, the top of each of which appears to have the "Labarum". The coin is similar to those described by Mr. King in his Early Christian Numismatics, p. 22. The legend on the reverse is very difficult to read, but it seems to be GLORIA EXERCITVS, and the letters AQB or AQS in the exergue. The coin appears to have been struck after Constantine became a Christian, i.e. after A.D. 323. The discovery of this interment may lead to further researches. It is not the first discovery of Roman interments, which have been found at the base of the hill, at Yatton (see Som. Arch. and Nat. Hist. Soc. Proc., 1851, vol. i, part ii, p. 59). A large urn holding nearly two gallons of Roman coins was found in a Roman cemetery at Yatton, at the foot of the encampment known as Cadbury Hill, and then the garden of the Rev Richard Symes. The bodies were all deposited about 18 inches below the surface, and the urn of black ware was nearly full of second and third brass coins of the later period of the Roman Empire. Mr. Stradling, in his paper, says, "I one morning collected 40 from the village shops, where they had been for some weeks passing for farthings.") One of these was of Orbiana Augusta, wife of Alexander Severus. On the hill to the east of Cadbury, above the present residence of Capt. William Long, Roman remains have also been found, consisting of much pottery and bronze implements, and the foundations of a dwelling; a boundary of loose stones has been traced in the wood, enclosing an area of several acres. Further up the Vale of Wrington, and following the same road to Redhill, about three miles, in the deep hollow and a quarter of a mile beyond the church is Lye Hole, where there is a stream of water, which runs into the Yeo River not far from Havyatt Green. About two fields from the farm house of Mr. Body, at this spot, and ascending up the hill to the south, there was found last summer the site of a Roman villa. Owing to the dryness of the month of July, 1876, the whole plan of the villa became evident in the turf, and led to the ground being opened, when the remains of a hypocaust were found. Many of the pilae were exposed, and were found to be constructed of roofing tiles from a still older building. The floor of the room laid open had however been destroyed, and nothing was found but remains of burnt matter, pottery of different kinds, and many roofing tiles. As it was evident that at some remote time the floors of the rooms had entirely perished, and nothing of importance was likely to be discovered, further examination was abandoned. of the old line of road was followed, but the ancient track, having become in places worn into deep channels, and being some times carried over very steep ascents, was diverted, so that the old and new roads run in many places side by side. It is impossible to say when the old road was first constructed, but it was evidently a very ancient line of traffic, and the Roman villa at Lye Hole is not more than a mile distant from the course of this road. In making the same line of road near Havyatt Green, about mid-way between the descent from Broadfield Down at Redhill and the ascent of the Mendip through the pass at Dolebury, the labourers "broke into foundations which were evidently Roman, and found a quantity of ancient pottery, Samian ware, and fragments of urns and sepulchral exuviae." This is recorded in a letter from the Rev. J. Douglas, author of the Neniae Britannicae, to the Rev. J. Skinner, rector of Camerton, and dated 18th June, 1817. The M.S. is in the library of the Bath Literary and Scientific Institution. Thus the Vale of W rington gives everywhere indications of Roman occupation, and that occupation probably extends from the days of Claudius Caesar,1 by whom the mines of lead in Mendip appear to have been put under tribute, as a pig of Roman lead of the date of Claudius was found at Wookey, and another, bearing the stamp of Britannicus, the adopted son of Claudius, has been found at Blagdon, and others bearing the stamp of Vespasian have lately been found at Charterhouse-on-Mendip, where Roman coins of an early period have also been found - as for instance consular coins of the date of M. Antonius the Triumvir. There is little doubt that, if care be taken to note the evidences of Roman occupation in the Mendip district, much may be found of real historical interest. TI . CLAVD .CAES. AVG P .M .TR .P .VIII .IMP. XVI. "Tropaeum ex oblonga plumbi tabula, in qua inscriptio haecce legebatur, prope Ogonen, uti refert Doctiss. Lelandus, circa initium seculi supra decimum quinti, aratro erutum est, et aedes Thos. Houardi Norf. Ducis, Londinium, eodem referentem translatum. "